If there was one word to describe sausage, besides awesome, it would be versatile. The sausage is perfectly suited for any meal any time of day. It has an endless array of flavor combinations and in it’s simplest form, sausage is portable and self-sufficient. More than once I’ve grabbed a sausage link on the fly. No bun, no plate, no fuss, just perfection in every bite. 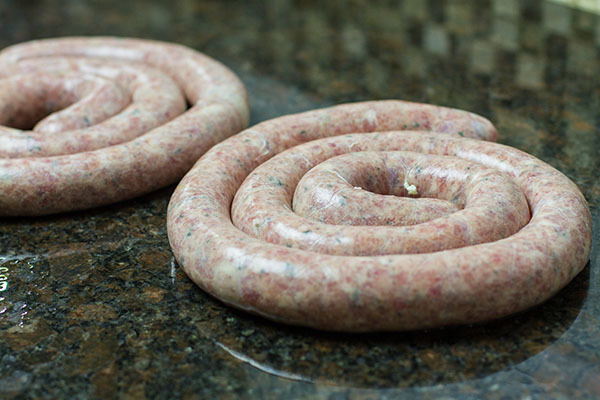 While you can buy a lot of great sausage, nothing beats the process of grinding, stuffing, and grilling your own. When working with ground meat, I am a firm believer in taking ownership of the meat and the process. The surefire way of avoiding mystery meat and to ensure quality is to buy and grind it at home. 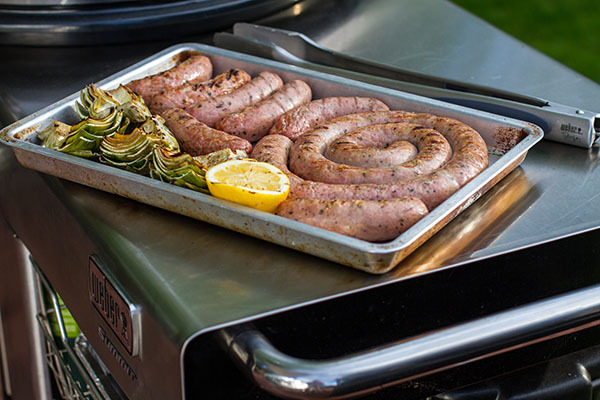 Grilling fresh sausage is a treat and with the use of a few tools, is very easy to accomplish. 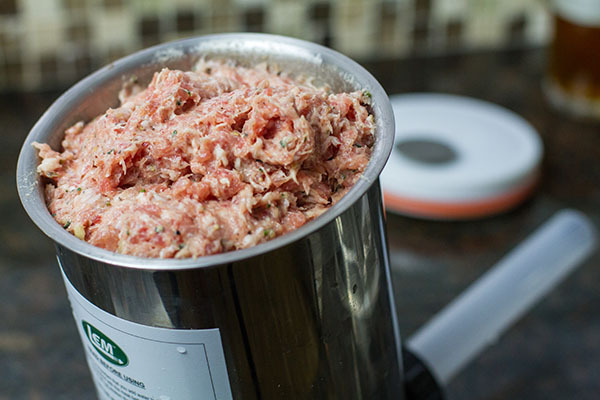 You can spend a lot of money on a dedicated meat grinder, but if you already have a stand mixer, a meat grinding attachment is a natural add-on. I grind a lot and my 20 year old attachment is still running strong. No stand mixer, no problem. A food processor also works. Make sure the meat is cut into inch sized cubes and the work is done in batches. No matter the way you grind, remember cold meat is key. Keeping the meat cold helps with emulsification during the cooking process. It can mean the difference between juicy and dry sausage. Freezing the meat, at least 20-30 minutes ahead of grinding, helps keep the temperature low. 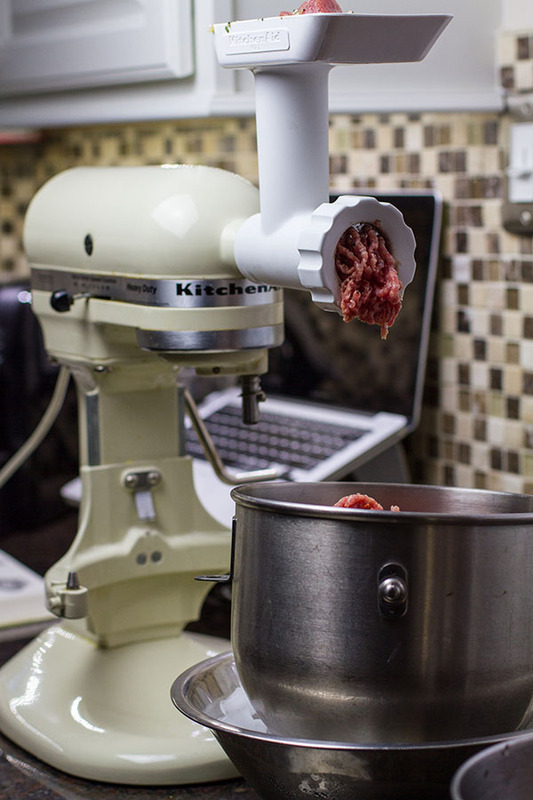 When using the stand mixer, I place the bowl catching the meat in another bowl full of ice. Sausage can be made from beef and chicken, but I love pork. Five pounds of boneless pork shoulder is an effortless combination of meat and fat and when it comes to sausage, fat is king. Add in 3 T of kosher salt and up to a cup of ice water during the “bind,” or mixing, and you have the foundation of sausage. The only thing left is your choice of seasonings and additions. 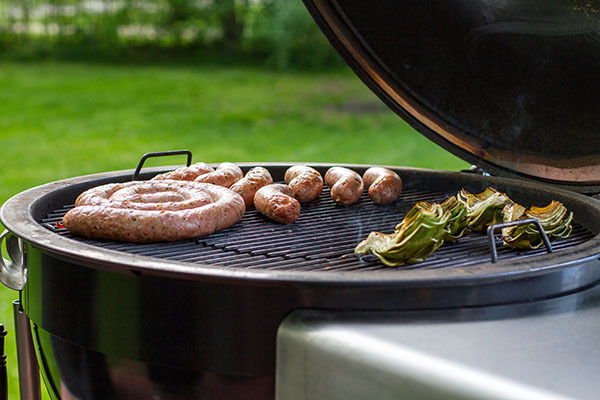 Sausage doesn’t have to be stuffed in casing, but when it comes to grilling, it’s a must. To make the process easy, I use a vertical stuffer. With the meat loaded in the piston, the hydrated casings are slid on the nozzle. A gentle crank forces the meat out. I use my hand to control the rate of fill. It takes only a matter of minutes. Making sausage is fun, but getting it on the grill is what I really enjoy. The best sausage needs to be grilled gently, as we want the temperature of the meat to rise gradually and the casings not to rupture. To accomplish this, grill the sausage over direct low (300 F) heat for approximately 2 minutes a side. This helps add color and flavor to the meat. Next, move the sausage to indirect heat and continue to grill another 8-10 minutes with the lid closed. The sausage is done when its internal temperature reaches 150 F with an instant read thermometer. For a perfectly grilled sausage, it’s important not to overcook. Have that thermometer ready! The only way to make sausage better is to make it yourself.